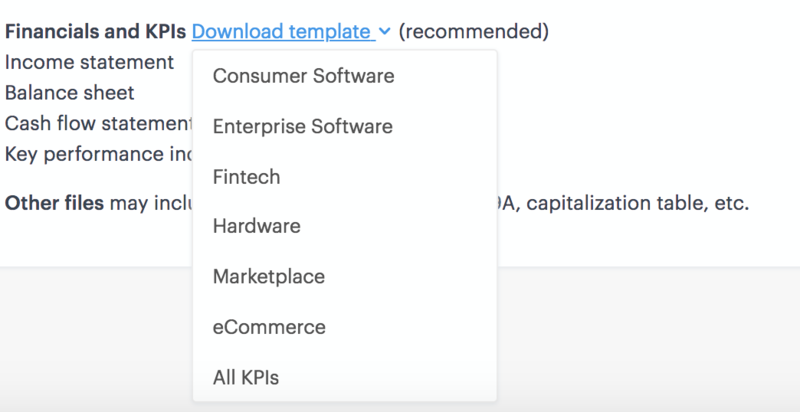 With Investor Updates, Carta companies can keep all stakeholders on their cap table (investors, board members, employees, and advisors) up to date on Carta. We give companies the tools to compose a mixed media update and attach all relevant files. Our financials templates are great for companies who are looking for guidance on what is important to investors. Companies sending update can also keep track of who has viewed updates. Investor updates can be accessed in the “Stakeholder” drop-down in your Carta account. This will take you to a page with all of your previously sent updates, where you can track views. From here you can “Compose new update” which will open a modal. 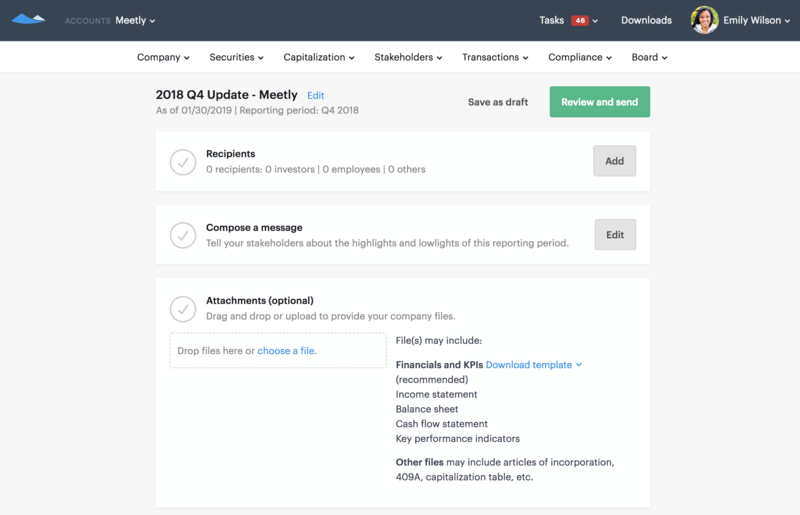 Here you can title your update, specify reporting cadence, a reporting period, and an as of date to help set the context for the update to your recipients. Once you fill out the modal, you're taken to a compose screen, where you can select recipients, compose a text update, and attach files. When selecting recipients, you can pick from the stakeholders on your cap-table. 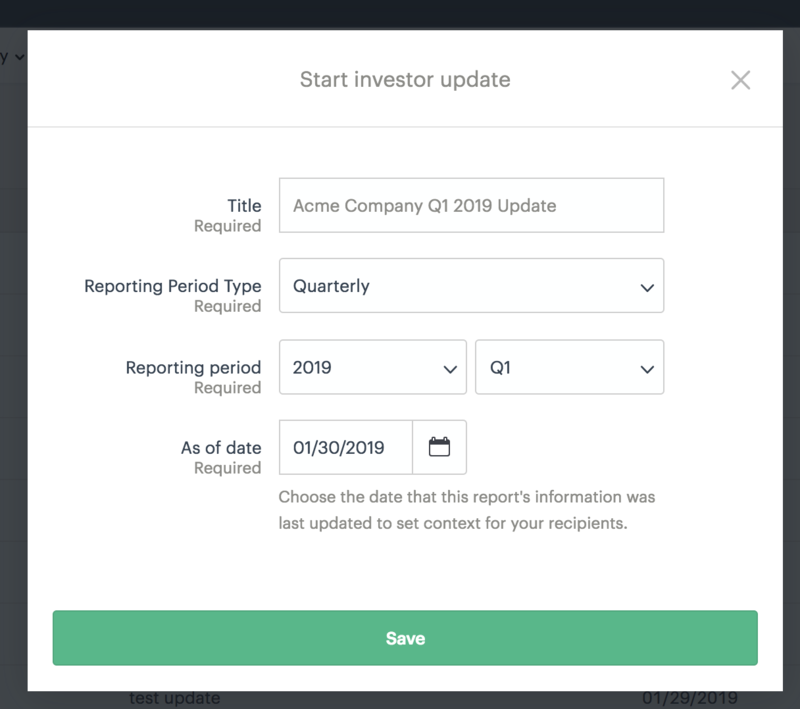 While the feature is called “Investor Updates,” you can use this tool to send updates to anyone on your cap table - employees, advisors, etc. You can use our helpful filters to speed up the selection process. You can even filter to the set of stakeholders your previous update was sent to. When composing the message, the text editor allows you to incorporate text, images, and videos. We hope you find this feature useful. If you have any feedback, please shoot us a note at investorservices@carta.com.